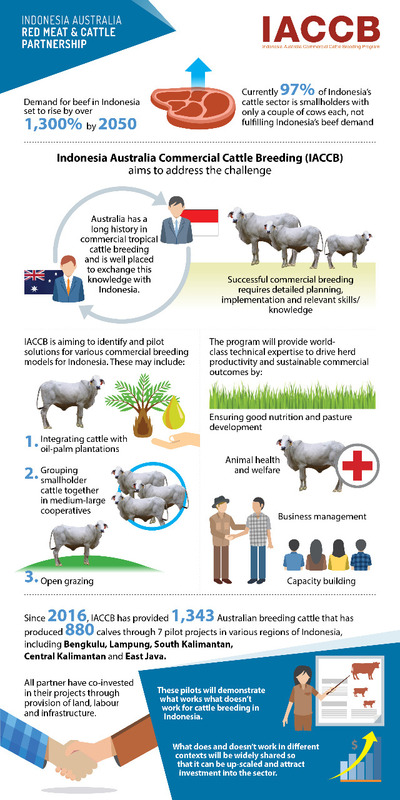 IACCB, which commenced in February 2016, is a project within the Indonesia-Australia Partnership on Food Security in Red Meat and Cattle Sector. IACCB’s goal is to expand the commercial-scale beef cattle breeding industry in Indonesia. It does this by partnering with eight project partners in six Indonesia provinces, and testing three cattle breeding models (1) Integrated Oil Palm and Cattle Production; (2) Semi-intensive Grazing and (3) Smallholder Cut and Carry.